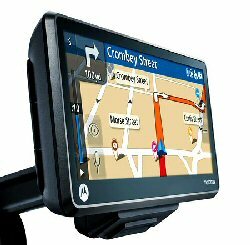 Thinking of leaving your portable sat nav GPS unit behind before you leave on your holidays this year? Think again. Here are ten good reasons why you should take it with you..
Satellite navigation has become an indispensable part of many peoples' traveling lives. But it's still not something we'd often think of taking with us on our holidays. With the growth of the kind of more portable GPS systems that many drivers now fit in their cars however, things are changing. Here are ten good reasons why you should stick your GPS in your suitcase before taking off on your holidays this year..
1. You no longer need a library of road maps for your car holiday abroad. One GPS with maps of 22 European countries holds all the information you will need. 2. Squabbles, discussions and rows about who can or cannot read a map become a thing of the past. Research has shown that people with a GPS in the car have fewer arguments during the trip than those who use road maps. 3. Hungry passengers and waning petrol levels are common ingredients for any family road trip but with points of interest now shown clearly on most systems, your GPS will take you smoothly to hotels, restaurants, cafes and service stations - wherever you happen to be at the time. 4. Gone are the days of getting out of the car in a remote part of Wales to ask a local how to get to your destination because you can't read the signs. With a portable GPS, your route is translated for you. 5. With a GPS, you can be impulsive - discovering new places outside the area of your route while afterwards returning to your original route hassle free! 6. Portable sat nav systems mean that you no longer need city maps as you're now led effortlessly on foot through quiet lanes and into pleasant squares. 7. When abroad, if you really want to immerse yourself in the local culture, you can also get the route description in the language of your holiday choice. 8. As a passenger, you can lean back undisturbed, nod off and enjoy a snooze; your days as chief map reader will be firmly behind you. 9. While those map-readers are encountering traffic jams on the Autoroute du Soleil, you'll be miles away on country roads avoiding the traffic jams. A TMC module on most good systems will warn you and suggest an alternative route. 10. The latest navigation devices are streamlined and ultra thin to fit easily in your pocket or purse, making a portable GPS your most reliable travel companion throughout your holiday.